Like I said, anything you could do to help would be greatly appreciated. And as it is March 4th, happy birthday Josh, we all love and miss you. 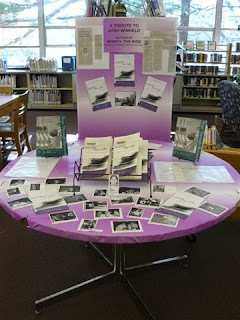 The East Cheltenham Library (Josh's local library) is currently displaying Josh's book -- front and center, along with information about muscular dystrophy. Josh's family appreciates the outpouring of support from the Cheltenham community. This December, we held our annual Cousins Dinner in memory of Josh. (As you may have read on this blog before, Josh was the true initiator, planner, and general mastermind behind the Cousins Dinner.) For the Cousins Dinner, Josh always saw to it that our five first cousins (who were in the general Philadelphia area) attended. This year, we all made sure that the get together took place. In the past, Josh selected a Philadelphia eatery, but this year, we held the Cousins Dinner at my recently purchased home. With Mandy in Australia (where she is continuing her studies) and Brett ill with a nasty stomach bug, we were left with five hungry participants. Everyone contributed a food/beverage and we ended up with a quality home-cooked meal. I believe that everyone involved will assist in continuing this tradition in memory of Josh. On Friday night, Jews around the world will light their menorahs and inaugurate the holiday of Hanukkah. It is the story of a miracle, of a little vial of oil which should have burned briefly and then gone out but instead burned for 8 full days. We call Hanukkah our ‘festival of lights’. Josh Winheld was a modern miracle. His light of life burned well beyond any of the medical predictions at the beginning of his journey with muscular dystrophy. His light of life burned brighter and warmer than anyone could have imagined. His courage, his strength, his compassion, his intelligence, his decency…..lit the light of hope for countless families of people in wheelchairs ……and all along, like in the story of Hanukkah, his light of hope did not diminish, but grew stronger and stronger everyday. In the Talmud, the rabbis asked the question: why don’t we begin Hanukkah with all 8candles lit and take one away everyday to symbolize the diminishing supply of oil? Their answer: with respect to sacred matters and matters of hope and faith, we only increase and never decrease. Josh Winheld labored to increase hope, light, love and courage his entire life. He never diminished hope or strength in anyone. He was a “nes gadol,” (a “great miracle” in our midst) who quietly and persistently worked and lived the best way he could for himself, his family and humanity. What Josh accomplished in his 31 years was nothing short of miraculous and as with the miracle of Hanukkah, we will forever remember, preserve and amplify the light Josh brought into our lives and our world. Josh was born on March 4, 1978 on a snowy day in Elkins Park Hospital, the first of the three children born to Linda and Michael Winheld. The Winhelds are an exceptionally close family who had an exceptionally big challenge to meet in life and met it with exceptional courage, grace and love. When Josh’s sister Amy was born, Josh was brought to see her in the hospital nursery and promptly asked if he could bring a different baby home. The reality is, nobody in the Winheld family ever wanted to trade places with anybody else. When Josh’s sister Stephanie entered elementary school, and looked around at the other kids and their families, it dawned her for the first time that everyone didn’t have a brother in a wheelchair. The reality is that very few of us have a brother like Josh, not because he was in a chair, but because he knew how to navigate life with grace and with a smile. And, sadly, not everyone in a wheelchair has a family like the Winhelds who can instill the inner confidence all of us need to travel through life whether in a chair or on two feet. Josh was diagnosed with Duchenne Muscular Dystrophy at age 4 and by age 10 needed a wheelchair to get around or as Josh put, “I became the first person in my class to drive.” He went to public school here in Cheltenham, gently challenging the school system to learn to better accommodate the handicapped as he went his way. He also attended religious school here at KI where he became a Bar Mitzvah in April, 1991 and was later confirmed. He went on to graduate from the Isaac Mayer Wise Program at Gratz College. He was determined to do everything kids do, and at the same time become expert in his medical condition, and ultimately an advocate for people in chairs. Josh could do a lot of things. He watched the cooking channel and then directed his helpers in the kitchen. He made a mean pickle. He convened an annual “cousins dinner”. He not only followed sports from the comfort of his parents’ den but went to the great stadiums of this country and Canada - Chicago, Toronto, New York, Pittsburgh, Baltimore , Atlanta, Boston and beyond. He even went to spring training. When the Phillies won the world series, not only did he go to the parade, he managed to talk a stranger into getting him into a second floor office in City Hall so he could see his heroes on Broad Street. Josh attended Temple University where he earned a BA in journalism and then started his Masters Program there in Urban Planning. It was at about this time that I personally met Josh. When I accepted the position of senior rabbi here at KI, a number of people came to me and told me about Josh and said that I needed to be ready to provide pastoral support to Josh and his family. Josh’s dad, Michael, was actually the only person at KI I knew at the time. Michael and I played softball together on a travel team at Camp Harlam for several summers almost 40 years ago. Michael was on third and I was on first. It was a good time. What I wasn’t prepared for was to meet a really “nice guy,” Mr. Josh Winheld, who seemed to know everything there was to know about sports, history, politics and a few other things to boot. I wasn’t prepared to meet a young man in a wheel chair who was always pleasant, polite and ready to greet and speak with me, whenever I happened to see him. Nor was I prepared for a guy in a chair who could do a really quick 270 degree turn and speed back to his keyboard in his room when our discussion was done, so he could get back to his work. On several occasions, Josh not only attended family funerals, including one here at KI, for his grandfather, Bob Rosen, but established himself as a great eulogizer…a young man in a chair with a sense of humor, even at funerals, who delighted in sharing risqué stories with his congregation with perfect timing and a self-effacing laugh. Because of his condition, Josh thought a great deal about death. His conclusion was to live as fully, as happily, and as productively as possible. Josh and I had numerous discussions and email exchanges about whether he should write a book or finish his masters first. I’m sure he consulted many people. When he made his decision to write his book, he plunged into his work, shielding the contents of his manuscript from just about everyone and produced a magnificent manuscript of 75,000 words with a hands-free computer using only head motions to write his text. The results: a powerful memoir, Worth the Ride, published by Little Treasure Books. The “book launch”, held in the Rothschild Auditorium at the other end of this building was one of the most powerful events I ever attended. Josh was no ordinary person. His power to help others was manifest in every word he shared that day, and every word he wrote down for posterity in his moving autobiography. The book was just the beginning. He then initiated an online blog, “Winheld’s World,” lectured at medical schools and talked to conventions of physicians. It was always the same message: respect everybody’s essential humanity, respect them for who they are and respect them for their dreams. Most of all, he wanted to help patients and their families know what to expect about life in a wheelchair. Strangers from London to San Fransisco, responded to him, trusted him, confided in him, cried to him and depended on him; and he was always there for them. The Hanukkah menorah has eight regular candles and one helper candle. Josh’s helper candle was lit and held by many people. Josh had many doctors, nurses and aides who cared for him, loved him and respected him. It took many hands to help Josh. He held everyone of those hands with his heart. Above all, Josh’s family were his helpers: Linda, Michael, Amy and Stephanie provided Josh with everything they could, every day, in every way, without hesitation or qualification. The miracle of love, like the miracle of Hanukkah, is self-replenishing. The well of true devotion never runs dry and is never sealed or unwilling to give of its nurturing water. The Winheld family will insist, if you ask them, that who Josh was and what he accomplished, all was a function of his spirit. But that spirit was not alone in this world. His family didn’t do what they had to do; they did much more, by empowering Josh with a unique sense of normalcy and mission in life. Anyone who ever visited the Winheld house on Rowland Avenue saw how Linda cared for her son - selflessly, perfectly, every day, often all night. Anyone who ever sat in their den, saw how Michael held his family together and gave the sense of security they needed to be a regular family with an incredible mission. Anyone who ever saw Josh, Amy and Stephanie together, saw a weave of sibling love as natural and warm as the light of a new summer day. 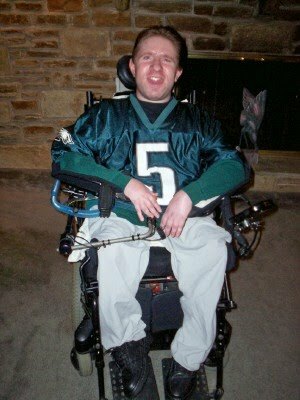 Josh Winheld died peacefully this Saturday, December 5, 2009 on a snowy afternoon in Elkins Park Hospital, 31 years after he had been born in the same place on a snowy day. Snow flakes, like little angels, accompanying him into and from this world. Now, the light of Josh’s life is extinguished; but the light of his spirit shines on and on in every good deed you do, in every kind word you share, in every tear you will ever dry, in every memory of him you hold in your heart. Zichrono L’vracha……Josh’s memory is a blessing. ·Mental or moral strength to venture, persevere, and withstand danger, fear, or difficulty. This sounds very much like the Josh we all knew and loved. I would also add the words from the gift made of Scrabble letters he hung proudly on his bedroom wall: Humor, Scholar, Journalist, Kind, Reader, Clever, Historian, and most important of all: Philly Fan. From his early days to the end of his life, Josh knew he had no control over the physical aspects of his disease, but he understood the power he had to keep the disease from defining the person he would be. I was devastated to think how horrible it must have been for Josh to read something like this. But, as he explained in his book, things “like this” only happened to “sick” people, and he was not sick. He just had trouble walking. When he went from crutches to a wheelchair, he viewed this not as a progression of his disease, but as a moment of “liberation.” Finally, he could effortlessly move about without the fear of falling, the risk of injury, and physical exhaustion. Throughout his academic career, he curried no favors and sought no special treatment. He wanted to be where he was because of who he was. Josh’s positive self-image and sense of worth gave him the COURAGE, CONFIDENCE, HUMILITY, AND EMPATHY to bare his deepest feelings so that others who followed behind him would know they were not alone. Josh was 9 years old when he drew this card for me after I broke my leg in a skiing accident. What struck me most was how someone in a wheelchair was feeling sorry for someone who could get better. This simple card from a child lifted my spirits and helped me through my recovery. This ability to connect with people was one of Josh’s special gifts that only got better through the years. I leave to the Rabbis the imponderables of Judaism. But suffice it to say, I believe in what I call “Cosmic Coincidences.” Josh died in the hospital where he was born. It was cold and snowy when he was born; it was cold and snowy when he died. My Bar Mitzvah torah portion dealt with God’s blessing and Abraham getting his new name. The torah portion this week talks about Abraham’s grandson, Jacob, and Jacob’s dream the night before he faces his brother Esau. At the end of the dream, as dawn breaks, Jacob gets his blessing and a new name: Israel. For almost 32 years, more than twice as long as those of us who loved him had hoped for, Josh wrestled his Angel on Earth and did a hell of a job. I believe he accomplished what God sent him to do and then blessed him and brought him home. Big Brother. He will always tell you the right thing to do, even if you don’t want his advice. How many of us will be as blessed at our life’s end to feel the same? Josh will be sorely missed. But he will never be forgotten. He leaves us all his legacy of the power of the human spirit and the challenge to do good and accomplish great things. Yes, Josh, I found you. We all found you. Because like your special game of hide and seek, you made it so easy to find you and to get to know you. With so many obstacles in your way and yet you made it comfortable for all of us. The conversation was rarely about you - - you were always more interested in everyone else. Josh touched our lives. He was a unique individual – as a boy, as a young man and as an adult. Not because he had muscular dystrophy or because he lived in a wheel chair, but because he made us know that he had his own mission to get on with his life despite the many obstacles. And boy did he get on with his life! - A graduate education at Temple with a Master’s thesis. - Cooking, blogging and writing a book that opened our eyes to the reality of Josh’s day to day life. As someone said to me recently: “he lived his life to his full potential and not many people can say that”. But that’s not what I’ll miss about Josh. I think some of Josh’s favorite moments were when he felt independent - - when you could get him alone. And just talk. Josh could talk about anything. He was spirited and he was interesting. He had a point of view and he was fun. 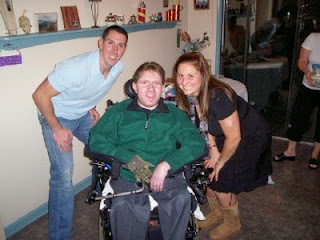 To Linda and Michael, we all know, Josh had an unbelievable support system and you were at the center of it. You helped make Josh the incredible person he became. Linda, my big sister, you amazed me with your selfless performance day in and day out. You were Super Mom, not just to Josh, but to Amy and Stephie as well. And you were much more than a mother to Josh - - you were his nurse, his friend, his cheerleader and his constant companion and you never made it seem hard because it was a labor of love. We all learned from Josh. I know I did. He had passion for what he was doing (and not just for the Phillies and Eagles). He had courage. But most of all, he gave us so much. Josh, for me, it was most definitely “Worth the Ride”. Josh truly was an unbelievable person. He accomplished more in his 31 years than most people do in a lifetime. I can list the things we all know about, like writing a book, getting his Masters, and organizing an awesome football tournament to raise money for DMD. But I think that Josh’s greatest accomplishment was just being him. He brought joy and love to so many people. He taught us how to see the good in every one, even if you have to look extra hard. He showed us how to fight against something that seemed unbeatable, which is apparent when listening to his favorite song, “The Boxer” by Simon & Garfunkel. Josh wrote in his blog “The lyrics seem to speak to the inner boxer in all of us, still fighting the good fight when everyone else thinks you're down for the count.” And what a fight he put up…he was with us for 31 years! That’s amazing!! That is a true accomplishment! Josh was always worried about everyone else, despite his own problems. One comment that Josh made to me just last week will always stay with me. We were talking about my upcoming wedding in July and he said “I don’t know Sar, July seems like a long ways away.” He then told me, “I hope you’re not upset with me if I can’t make it.” It amazed me that his first thought would be of my feelings, but that’s just how Josh was. And that’s why we all loved him so much! There’s no easy way to say goodbye to someone you love so much, but I don’t think we have to. I know that Josh is always going to be with us, he just may have a different view. There’s a quote in a song that I feel truly puts into words how I feel about Josh and it goes like this: "It well may be that we will never meet again in this lifetime so let me say before we part: So much of me is made of what I learned from you. You'll be with me like a handprint on my heart. And now whatever way our stories end, I know you have rewritten mine by being my friend." As you may or may not know, well over 400 people attended Josh's funeral. So many people were impressed by the words spoken in tribute of Josh that we thought those of you who could not be in attendance might find these eulogies of some consolation. The following are four of the five eulogies. Josh Winheld's funeral will be held this Tuesday, December 8th at Reform Congregation Keneseth Israel (8339 Old York Rd., Elkins Park, PA 19027) at 11AM. Josh's family appreciates your continued support at this extremely difficult time. Today, my courageous and inspiring brother, writer of this blog, lost his battle with Duchenne muscular dystrophy, despite his strong will and great determination to keep fighting. We will keep the blogosphere posted regarding funeral arrangements. Josh's family and friends greatly appreciate your support at this difficult time. It has been a long few months for me, between working on my master's thesis and dealing with some serious cardiac issues. As a result, I never wrote some of the entries I had intended to write never. So I'd like to take this opportunity to update my readers on some of the goings-on in Winheld's World. I visited with my friend and former neighbor, Branden, in mid-August. Despite his physical disability, he has now lived independently for more than two years, and I wanted to check out his place. Though he is several years younger than I am, we got to know each other when we used to share paratransit rides. After being on a long waiting list, he was able to move out of his parents' home into an affordable, fully accessible apartment (see photos) in a housing development for people with physical disabilities in Philadelphia. Living on my own is something I have always hoped to do. But beside the fact that there is such a shortage of affordable accessible housing in general, it would be a bit more challenging for me because I require nursing care and cannot be left on my own. Still, I was encouraged to see that there are options out there. Meanwhile, I plan on visiting Branden again -- the guy has a fully stocked refrigerator! In early October, I attended an engagement party for my friends Sarah and Vinny. Sarah and I have known each other since 7th grade. Sarah was the new girl in school that year and practically every guy, including yours truly, had a crush on her! I was pretty shy around girls in those day, but because she lived around the corner, I always made sure to pass by her house in case she was around. Over the years, we have remained good friends. Not only did she come up with the title for my book, but she is also the subject of a humorous anecdote in the book. So it was really wonderful to be in attendance at her engagement party. I've gotten to know Vinny over the past few years and we always seem to hit it off well. July seems like a long time away, but I hope with all of my heart that I will be there to watch them walk down the aisle together. Finally, in recent weeks, there has been a changing of the guard with my caregivers. First, I lost my long-time evening attendant, who moved out of the area. Then, one of my nurses, who was not only a good nurse but was also available on Saturday evenings so I could get out and socialize with friends, quit in a squabble with my nursing agency. The details really don't matter. But the point is that in the course of two weeks, I lost two really good caregivers to whom I had grown close. I'm not one to hold a grudge. I appreciate all that my nurses and aides do for me and when it is time for them to move on, I always wish them luck and hope they stay in touch. The good news is that where one road ends another one begins. My other aide who works in the morning recommended a friend to fill my evening hours and she turned out to be extremely pleasant and dedicated. As for Saturday evenings, a new nurse that had recently come aboard offered to take those hours. I immediately agreed in light of the fact that she is an excellent nurse and we get along well. It helps that we are fairly close in age and she is also a rabid Phillies fan like I am. Of course, training new staff requires some energy and patience on my part and unfortunately, as I have grown weaker in recent years, it has become a little more difficult. In the end, however, it's always good to see some fresh faces, especially if they are good caregivers. I borrowed my nurse's Simon and Garfunkel CD this week and I haven't been able to stop playing it! The music is like an old friend you haven't seen in many years but whose company you always enjoy. "Mrs. Robinson" used to be my favorite Simon and Garfunkel song, but "The Boxer," seen above, has replaced it as my favorite. The lyrics seem to speak to the inner boxer in all of us, still fighting the good fight when everyone else thinks you're down for the count. My inner boxer is alive and well. Is yours? Every year, my friend Rob and I get together to watch an Eagles game -- and every year, the Eagles manage to lose, whether it be on an incredible 63-yard field goal with two seconds left or simply with an uninspired loss. Since Rob and I are such a lousy combination, we decided to get together this year with our mutual friend Marc. Turns out that we are all losers together, as the Eagles fell behind the San Diego Chargers early and were never able to recover. But it wasn't all bad. After all, you can never beat chicken wings and cheesesteaks! Seems that in my old age, I have become quite the eater. And it was a lot of fun spending some time with my old buddies. Whenever we get together and talk sports, it's as if we are teenagers all over again, as we recount the games and players of our youth. We also had the opportunity to do something all Philadelphia fans are very good at: complain when our team stinks. But when we were growing up, the thought of seeing the Phillies win the World Series, let alone the Eagles playing in multiple NFC Championship games, was pie in the sky. Things have certainly changed on the local sports scene since then, but true friendship is always a constant. However, if you want the Eagles to win, don't let the three of us watch together! About Me: Diagnosed with Duchenne muscular dystrophy (DMD) when I was 4 1/2 years old, I have been in a motorized wheelchair since age 10. Now 31, I have been ventilator-dependent for seven years. Despite my disease, I have strived to live as normally as possible. I was mainstreamed in public schools, graduated college with a journalism degree, and am currently pursuing a master's degree in urban studies. Winheld's World chronicles my daily experiences in living with DMD and with a disability in general. I also use this blog to promote my autobiography, Worth the Ride: My Journey with Duchenne Muscular Dystrophy (iUniverse, 2009).